_I make a variety of Kitchen Knives in both 440C stainless and O1 carbon steel - from small paring knives to very large French style chefs knives. If I could only have one knife, it would be an eight or ten inch traditional French style chef knife with a 1/8" or 5/32" thick blade - the heel is heavy enough to cut through poultry bones, there is enough of a curve to use a rocking motion to chop, a thin enough cross section to slice effectively and a fine enough point to mince a garlic clove or bone-out with. If I could have two knives? The large chef's and a nice little paring knife with a 3/32" or 1/16" thick blade and very fine point. Nothing looks or feels better on a good kitchen knife than a beautiful wood handle. I find thick, heavy planks or logs of tropical hardwoods from the Yucatan - woods like Tzalam, Ziricote, Sapodilla, Guayucan and Granadillo. They are exceptionally hard and heavy, with natural oils and they age beautifully. If you'd like, I could also do a black handle of canvas, linen or paper micarta that looks very professional and will not be effected by moisture in the kitchen. Kitchen knives are usually flat ground to a very fine edge and are then sharpened with a fine bevel and honed to razor sharpness. The chefs knives have a slight convex grind towards the cutting edge. If you'd prefer, I can grind steak knives and very small paring knives with a hollow grind - the edges are a little more delicate than those on flat ground blades, but they cut with very little resistance. Chef's and slicing knives generally have a hand rubbed finish, paring and steak knives a satin belt finish. 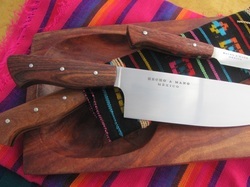 I can etch initials, a name or design on the blade, whether it's for you, or for a gift. Please see the "Available Knives" pages for photos and descriptions of Kitchen knives in stock.